Standard quality folder. With clear front cover, full-length label holder and cut-out to facilitate page turning. Now available in 3 limited edition Trend colours. Standard rigid PVC folder. With a clear front cover, full-length label holder, channel for suspension rail and cut-out to facilitate page turning. A4 Clear-view project file with transparent cover and pocket for loose sheets. Standard quality folder with clear front cover. The extra-wide quality folder for daily use, also suitable for use with punched pockets. With label holder at the bottom of the front cover and channel for suspension rail. 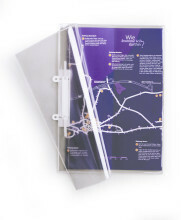 A4 folder with transparent extra-strong PVC front cover and translucent rigid PVC back cover with clear inside pocket. Channel for suspension rail 1531. 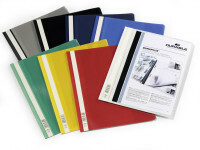 Rigid PVC folder, with a clear front cover and removable filing strip (punched 80 mm) for filing in oversized Lever arch Files and Ring Binders. With full-length label holder and channel for suspension rail. 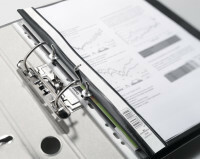 A strong and versatile folder for up to 50 sheets of A4. Flexible filing straps can be used to file the paper only or adapted to make loops for filing the folder into ring binders and lever-arch files. A quality folder for superior presentation. For quotations, certificates, reports, presentations, job applications and business reports. Folder with pull-out filing mechanism. Ideal for storing punched and unpunched papers together in lever arch files.